It is an NPN transistor which is the general purpose one used in switching applications. It has three leads- Collector, Base and Emitter. When the base gets a biasing voltage, current flows from the collector to emitter. Thus it acts as a switch. We can easily identify the pins of BC 547. Hold the Flat side on which the number printed towards you. Then count the pins. First pin is collector, second one base and the third pin emitter. So the arrangement is C-B-E. Its complementary PNP transistor is BC 557 and its pin assignment is E-B-C. 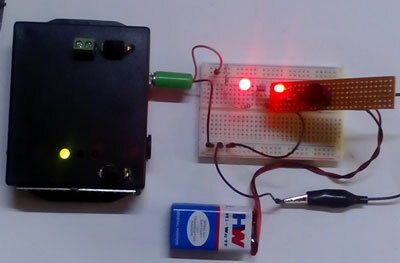 It is the Piezoelectric buzzer that has a circular plate with Piezo electric material. There is an oscillator circuit with resistors, capacitor and a transistor. 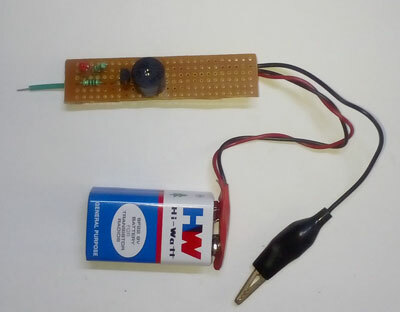 When we connect the buzzer to battery, the circuit inside oscillates and the Piezo disc vibrates. These vibrations generate sound. 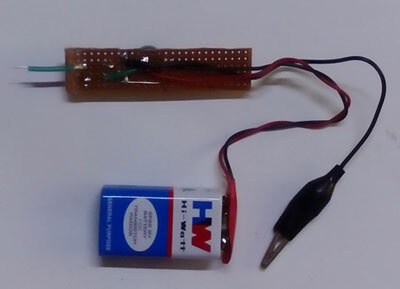 The PCB mounting type Piezo buzzer works off 3-12 V DC. 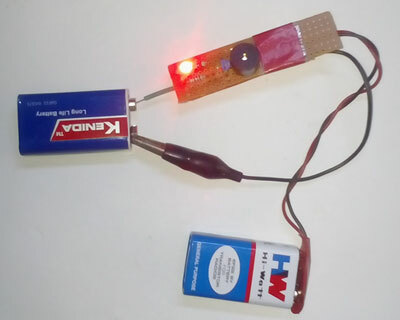 This is used to take power from the 9V battery. It has two clips to connect with the battery and positive and negative leads. It is the general purpose PP3 battery used in Projects. It is generally 500 mA rating. 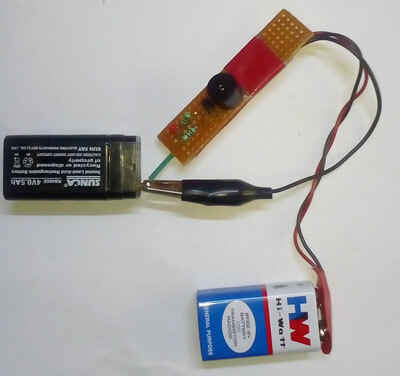 The Negative of Piezo buzzer is connected to the Collector of BC547 and its positive to the positive of battery. The base of BC547 has the 1K resistor to restrict the base current. The other end of 1K resistor is free and acts as a Probe to touch with the PCB under test. 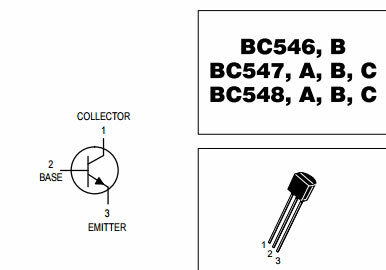 The emitter of BC 547 is connected to the negative of battery. 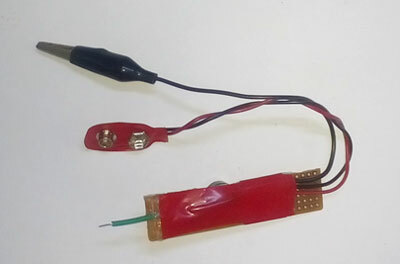 The Alligator clip is connected to the negative of battery using wire. It is used to connect with the negative of the PCB under test. So this is the testing procedure. 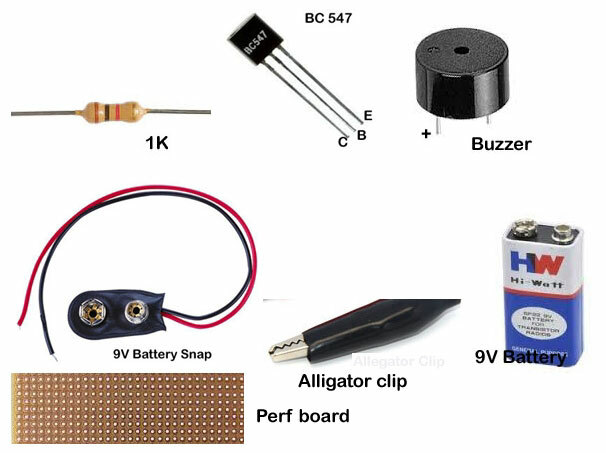 Connect the Alligator clip to the negative of the PCB under test and connect power to the PCB. 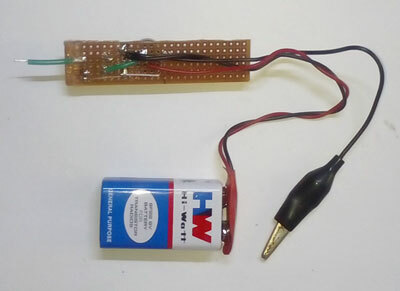 Touch the positive rail of PCB with the free end (probe) of resistor. Buzzer sounds to indicate the presence of power in the PCB. 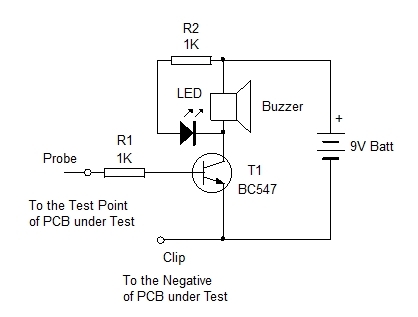 Similarly test each points of the PCB to confirm the presence of power. Remember, the negative sides will not give any indication. Transistor BC 547 is doing the trick. When we touch the probe to the test point, if power is available, base of the transistor will be biased and it then conducts. The buzzer then gets a current path through the collector-emitter of the conducting transistor. Testing the Bread board assembly power using the PCB tester.